I have found a good use for those horrible rubber cam belts that otherwise get thrown away when they are changed. I made a strap wrench out of bits of scrap metal and an old cam belt. I put the first one together quickly without any special tools, just a hacksaw, drill, vernier callipers and a welder. It turned out better than I expected so I then made a larger, heavy duty version. 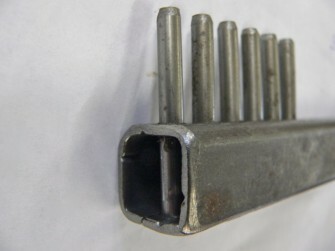 To make the first wrench I began by measuring the distance across ten teeth in order to get a reasonably accurate figure for the tooth spacing (on this belt it was 8mm). A line of six 5mm holes were drilled at this spacing down the middle of a piece of 20mm box section steel. 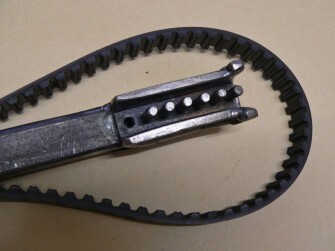 Pieces of 5 mm rod were cut to length, 20mm longer than the width of the belt. They were then tapped into place in the holes and a line of weld was run down the back of the box section to fix them in place. 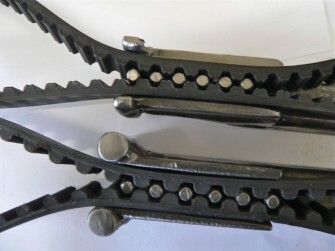 Two pieces of 5mm strip were cut off 50mm long and welded on to form the sides, allowing room for the belt to be slid on reasonably easily. I tried it out and was very pleased at how well it worked. I then decided to make a more robust version using a larger cam belt. This second one is significantly stronger. I made larger fulcrums for it (9.5mm), which means there is less aggravation to the belt as the bend is less sharp. 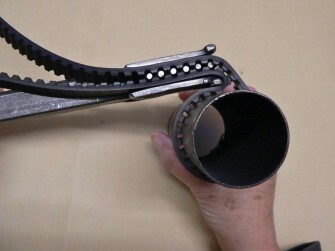 Strap wrenches are ideal for uses such as holding grinding wheels when changing them, undoing oil filters and undoing stubborn petrol and radiator caps on vintage vehicles (or anything round that you do not want marked), also for plumbing to hold taps while attaching or undoing the pipework. They can be used clockwise or anticlockwise very easily.